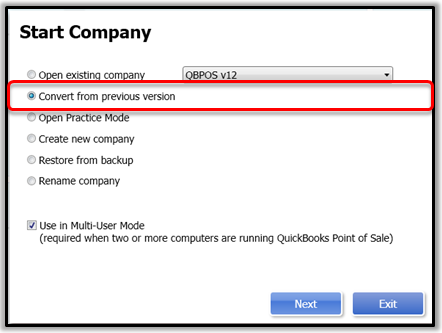 Learn how to convert your company file after upgrading your QuickBooks Desktop Point of Sale to a newer version. You cannot revert an updated file to its previous version. Only the SysAdmin can update the file.If you never created other users, you are automatically the SysAdmin. If you do not see Company Operations under the File menu, then you are not signed in as the SysAdmin. Make sure your QuickBooks Desktop Point of sale is on the latest release. Open the new version of QuickBooks Desktop Point of Sale. From the File menu, go to Company Operations. Choose Convert from previous version, then Next. 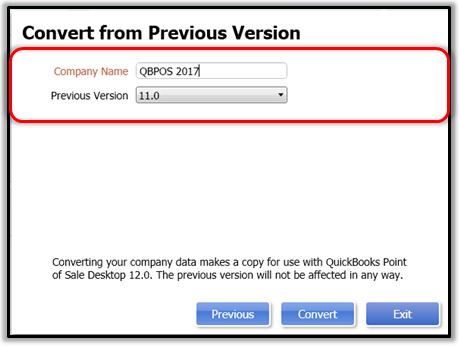 Enter the Company Name for your converted data file, then select the Previous Version of QuickBooks Desktop Point of Sale that you are converting from. After the conversion process completes, you can access all of your data in the new version of Point of Sale. If the conversion of your data is unsuccessful, restore the most recent backup made in your previous version. If any of that didn't work, your file needs to be checked by Data Services. Please contact support for assistance.